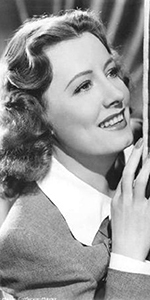 Irene Dunne was an enduring figure in Hollywood movies. Her career spanned her younger ingenue years, and progressed well into middle age. She was the reigning Queen of the "woman's picture" which could encompass drama as well as comedy. Dunne's father was a steamboat inspector for the U.S. Government, which allowed Irene to spend much time traveling the Mississippi in search of adventure. Unhappily, father Joseph died when Irene was 14; the family moved to Madison, Indiana, where she concentrated on her piano and singing lessons, singing in church, then graduating from high school in 1916. Initially wanting to be an art teacher, she spent the next 10 years on a scholarship to attend the Chicago Musical College. Upon graduating, she auditioned for the Metropolitan Opera, but didn't pass muster. Turning to musical theatre, Dunne met with success taking over the title role in the musical Irene, which had opened on Broadway in November, 1919. The original Irene, Edith Day, left the show to open the production on the West End, so Dunne took over her part in April, 1920, staying with the show until mid-1921. She also enjoyed a success with The Clinging Vine during the 1922 season. Marrying dentist Francis Griffin in 1927, Dunne's wedding vows included giving up the stage, but a chance meeting with producer Florence Ziegfeld landed her the lead role in the national touring version of in the legendary musical Show Boat in 1929. R-K-O offered Dunne a contract, with her first film being the musical comedy Leathernecking (released in September, 1930) with Ken Murray. She and her mother moved to Hollywood and began to crank 'em out, playing long-suffering female leads in Cimarron (released in February, 1931) with Richard Dix, Back Street (released in December, 1932) with John Boles, and Magnificent Obsession (released in December, 1935) with Robert Taylor; she got top billing and introduced the standard "Smoke Gets in Your Eyes" in the early Astaire / Rogers musical Roberta (released in March, 1935). Husband Griffin rejoined Dunne in Hollywood in 1936; that same year, she starred in the famous film version of Show Boat (released in May, 1936), which remains one of her signature roles. Despite the bluesy nature of many of her roles, Dunne found herself enjoying working in the comedy Theodora Goes Wild (released in November, 1936), so comedy became another skill in her kit-bag. She did three great comedies, The Awful Truth (released in October, 1937), My Favorite Wife (released in May, 1940), and Penny Serenade (released in April, 1941), all three with Cary Grant. It seemed as though Dunne could play anything, from a romantic lead in Love Affair (released in April, 1939) with Charles Boyer, to a fish-out-of-water schoolteacher in Anna and the King of Siam (which premiered at the Chinese in July, 1946); there was so much buzz about Anna that Sid Grauman had both Dunne and co-star Rex Harrison make their imprints together just slightly before the picture opened. 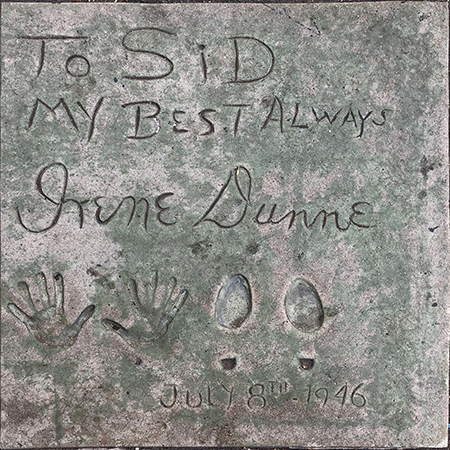 Dunne did a little television, including appearing as hostess on the Schlitz Playhouse in 1952 on CBS, did a number of roles on The Ford Television Theatre in 1954, 1955 and twice in 1956, on CBS, The DuPont Show with June Allyson in 1959 on CBS, and General Electric Theatre in 1962 on CBS. She was asked by Walt Disney to christen the Mark Twain riverboat on the opening day of Disneyland in 1955, and in 1957, Dunne was appointed one of five alternative delegates to the United Nations in recognition of her caritable works. She became the first woman to sit on the board of directors of Technicolor. Husband Frank died in 1965. She made her final appearance in public at a dedication at St. John's Hospital in Santa Monica, for which she had done much fundraising. She passed away at home in 1990 at the age of 91. Grauman's Chinese Theatre, Hollywood, California. Irene Dunne Forecourt ceremony, Monday, July 8, 1946. Sid Grauman helps steady Ms. Dunne, whose arm is held by Rex Harrison. 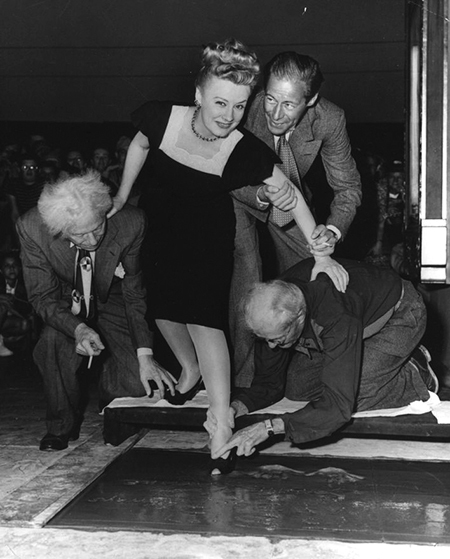 Her shoe is being imprinted in the cement by cement artist Jean Klossner.